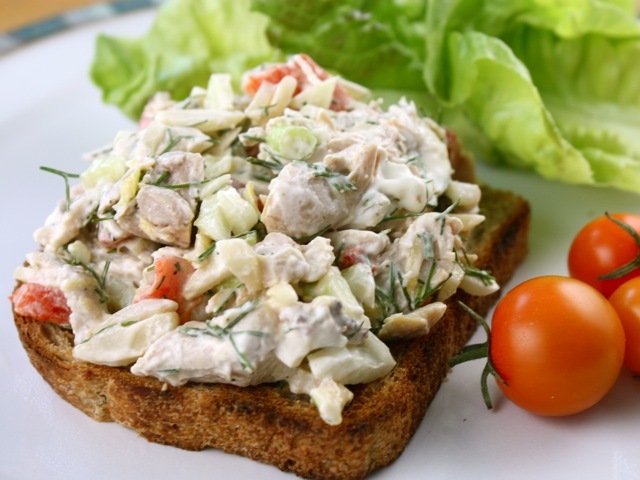 You can roast a whole chicken for chicken salad, but in the summertime — which is really when you want chicken salad anyway — poaching a few pieces of meat is faster and less sweltering in the kitchen. Plus, you can strain the flavorful poaching liquid and use it to cook quinoa, farro, or any other grain you like, then toss the chilled cooked grains in a grain salad. That's two summery salads for the price of one. This recipe — very similar to Chicken Salad with Fennel, Almonds, and Lemon Mayo — is really just a guide to proportions. Feel free to mix up the mix-ins, depending on your preference and what's seasonally available. Poach the chicken: Put a few tablespoons of olive oil or butter in a Dutch oven or stockpot. Add the onion, garlic, and fennel, and cook over medium to medium-low heat until the onions are starting to turn translucent. Add the chicken and pour over the wine (if using) and the stock or water. Make sure the chicken is covered by the liquid. Add the thyme and saffron (if using) and heat just until the liquid starts to simmer. Cook, with the liquid just barely bubbling now and then, for about five to 10 minutes, until the chicken pieces are just cooked through. Turn off the heat and let everything cool down for an hour or so (you can remove the chicken pieces for faster cooling). Assemble the salad: Put the mix-ins of your choice into a large bowl. Cut the cooled chicken into small, bite-size pieces and add them to the bowl. Add the dressing ingredients and gently toss everything together. Taste and correct for seasonings, then serve as you like: in a sandwich, a wrap, or just on a bed of greens. Culinate editor's note: If all you have are chicken parts with skin and bones still included, simply strip the skin off and poach the pieces whole. You'll have enough liquid; you'll just need to let the chicken parts cook for 20 to 40 minutes, depending on how big the pieces are. Let cool, then remove the pieces from the broth and strip the meat from the bones (it should fall away from the bones) and then chop into bite-size pieces.